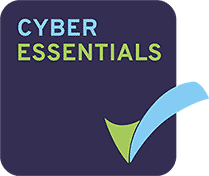 Armadillo Sec are certified by CREST as a Cyber Essentials certifying body offering certification for Cyber Essentials Basic (stage 1) and Cyber Essentials Plus (stage 2). We offer help and guidance throughout the certification process at no extra charge. Should you fail the Basic assessment we will perform a retest free of charge once you rectify any issues. For Plus certifications we only charge for internal retesting if required. 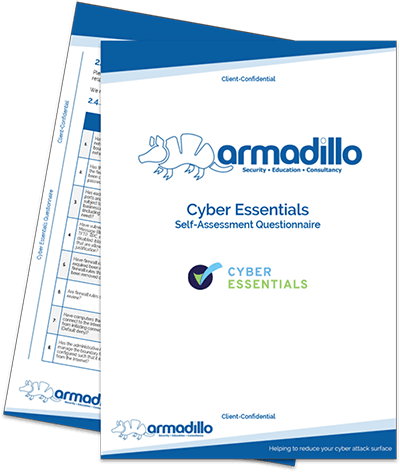 All certifications now include our exclusive Armadillo Certification Pack which includes a high quality printed certificate along with a Cyber Essentials sticker pack so that you can display your certification status and your commitment to cyber security. Read our Feedback from customers we have already certified, watch our quick and simple Video Guide, use our Pricing Tool to calculate your certification cost and Download the self assessment questionnaire for free before committing to buy. We offer help and guidance throughout the process at no extra charge. Should you fail the Basic assessment we will perform a retest free of charge once you rectify any issues. For Plus certifications we only charge for internal retesting if required. Read our Feedback from customers we have already certified, watch our quick and simple Video Guide and Download the self assessment questionnaire for free before committing to buy. The scheme identifies some fundamental security controls that organisations should have in place to secure themselves against common cyber threats. What are the benefits of the Cyber Essentials certification? A simple virus or piece of malware could result in loss of company and client data, disrupt your cashflow and take up staff time. An attack could also put off your customers, stop you trading and damage your hard-earned reputation. Loss of data could breach the Data Protection Act and lead to fines or prosecution. Achieving the certification will also allow you to use the Cyber Essentials badge to advertise that your organisation meets a Government-endorsed standard. How to become Cyber Essentials Basic certified? This is a self-assessment certification that combines a security questionnaire and an external vulnerability scan of Internet facing systems for your organisation. We will review the self-assessment questionnaire and external vulnerability assessment results, and if both areas pass you will be issued a Cyber Essentials certificate and can use the certified badge. Stage 1 assessments are all conducted remotely, no onsite visit is required. We will issue you a self-assessment questionnaire that must be completed and returned. We will schedule and conduct an external vulnerability assessment against your Internet facing systems. We will review the results from steps 1 and 2 and issue a pass or fail. If you pass, we will issue your certificate. If you do fail, we can work with you to help you prepare and conduct a re-test. How to become Cyber Essentials Plus certified? This combines a self-assessment security questionnaire, an external vulnerability scan of Internet facing systems as well as authenticated vulnerability scans of your internal workstations and mobile devices. We will review the self-assessment questionnaire and external vulnerability assessment results, then arrange an onsite visit to test your internal workstations and mobile devices. If all elements of testing pass you will be issued a Cyber Essentials Plus certificate and can use the certified badge. Authenticated vulnerability scan of internal workstations. Email and web download protection against malicious file types. Mobile device and tablet basic security review (pin code protection and malware). 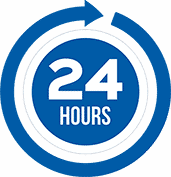 We are able to turnaround Cyber Essentials Basic assessments typically within 24-48 hours. We understand you may need the certification fast in order to do business with other companies, so we respond quickly. For Stage 2 Plus assessments we are very flexible and will work with you to identify the best date and time to conduct our on-site visit to your premises. Are you an MSP/I.T Support company looking to provide Cyber Essentials certifications to your clients? We have made a quick and simple how to video guide to explain the process. Use our pricing tool to calculate the costs for Cyber Essentials Basic and Plus certifications. Calculate the cost for new certifications, renewals, retests and upgrades from Basic to Plus. If you would like to view the self-assessment questionnaire before purchasing, you can download this for free below. You can buy online now by selecting one of the certifications below or request a quotation if you would prefer to receive a proposal and purchase later. Don’t just take our word for it, see our feedback from customers we have already certified. Certifications do not expire, however it is recommended to re-certify every 12 months to ensure your environment and processes are secure. If we do fail, can we try again and what is the cost? For Basic certifications we will perform a retest free of charge once you have rectified any issues. For Plus certifications we will reassess the questionnaire and re-run the external vulnerability scan free of charge, however we will need to charge if we need to revisit your premises to rerun the internal assessment. If I want to get Cyber Essentials Plus, do I need to do the Basic certification first? Cyber Essentials Basic is included as part of the Cyber Essentials Plus certification, so there is no need to purchase the Basic certification, if you are going straight for the Plus. I already hold Cyber Essentials Basic, can I just upgrade to Plus? This depends on the certification body that you used for the Basic assessment and how recent the certification is. However, in most cases we can use the questionnaire already completed without having to start again. We offer upgrade paths at a discounted cost if you already hold the Basic certification. Why is the CREST Cyber Essentials certification different? All Cyber Essentials certifications require organisations to complete a questionnaire to self-certify on the organisation's security controls and configurations, however CREST Certifying Bodies also conduct a remote vulnerability scan to validate elements of the questionnaire. What is the difference between Basic and Plus certifications? Should the organisation's protection mechanisms fail, how likely is it that the organisation will be compromised due to failings in the patching of the organisations workstations? The Plus certification is a more thorough assessment of the organisation and, as a result, may provide greater security assurance. We use Apple Macs or Linux, can we still be Certified? Absolutely, the assessment is not just limited to Microsoft Windows operating systems. If your end users are using Apple Macs or Linux, then you can achieve the certification. We have multiple offices, Can we certify just one office? If you have multiple UK or even Global offices, you can certify just one office or just the UK office if you wish. The certification scope is then limited to that one office and the certificate would state the office that is certified, rather than the entire company. If you have any further questions, please use our Contact Us page to submit your query.